Parent Company: Columbia River Knife & Tool Inc.
Columbia River Knife & Tool (CRKT) is an American knife manufacturer based in the small town of Tualatin, Oregon. The company is well-known for its extensive lines of knives, tools and accessories, although it is primarily regarded as a knife maker, with several interesting and popular innovations to its name. The company prides itself on “purpose-driven” designs and the creation of knives and tools customized for specific applications, and for this reason they work closely with many well-known knife designers. The company was founded in 1994 in Oregon by Rod Bremer and Paul Gillespi, both former employees of the Kershaw Knives company. 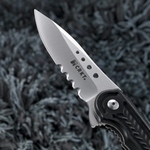 CRKT’s first big success arrived in 1997, when Bremer and Gillespi introduced their K.I.S.S. (Keep It Super Simple) knife, a compact, folding design created by knifemaker Ed Halligan. The instant success of this innovative model allowed CRKT to expand production, and since the late 1990s the company has been at the forefront of forward-thinking contemporary knife design. Today, CRKT offers its customers a huge variety of both folding and fixed-blade knives for a variety of applications, especially hunting and fishing knives, tactical and survival models, as well as a large selection of multitools and knife accessories. Designers who have worked with CRKT include Ken Onion, Allen Elishewitz, Liong Mah, Steven James, the Graham Brothers and many others. Columbia River Knife & Tool’s main claim to fame is their pursuit of unique, innovative designs and purpose-built solutions to particular problems, rather than a strict adherence to classic or well-worn designs. As a result of this pursuit of new product concepts, CRKT’s catalog is full of knives and accessories that feature a number of unique features and patented elements. Some of their best known patents include the AutoLAWKS locking mechanism, the OutBurst assisted opening mechanism, LockBack Safety and Veff-Serrated edges. The AutoLAWKS system offers the basic elements of a standard liner-locking folding knife with an added safety feature, namely a metal component that makes sure the locking mechanism remains in the locked position while opened. While the system functions in the same way as a standard liner lock, the AutoLAWKS adds a rotating, spring-action metal disk that adds an extra element of safety. The Lock Back safety is similar to the AutoLAWKS, although it uses a manual switch in order to control the safety lock of the blade. The OutBurst mechanism is a method of adding a spring-loaded assist to the standard folding-knife opening mechanism, whereby a spring tab catches the blade and quickly pops it into the open position when it reaches the 30-degree mark. 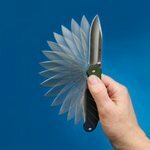 This allows for a smooth, quick opening of the folded knife using the thumb, without the need for extra force or a “flick of the wrist” maneuver. Veff-Serrations, developed by knife maker Tom Veff exclusively for CRKT, are essentially a modification of “normal” knife serrations, making them larger and placing them at 60 instead of 90 degrees in order to allow for easier cutting on a variety of materials. Aside from its unique patents, CRKT is also distinguished by its comprehensive warranties on all its products. The company also highlights its commitment to high-quality materials, and its webpage contains clear explanations of the types and grades of steel it uses in its knives and accessories and discussions of the importance of various aspects of steel for different knife applications. CRKT’s best-known product remains the K.I.S.S. series of knives, the main element of the company’s “Everyday Carry” line of all-purpose folding knives. The standard, original K.I.S.S. model, designed by Ed Halligan, features a Tanto-style blade, two-piece construction and a bead-blast finish for easy gripping. 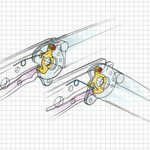 The frame includes an integral locking system designed to keep the blade secure even during tough tasks and a special seal to keep the cutting edge tight against the handle. The 2.25-inch blade is released with one-hand via a standard thumb stud, and it can be closed with one hand through the frame lock release. The knife is available in a number of razor-sharp and serrated edges, and both blade and frame are made of decent-quality 420J2 stainless steel. The basic model features a pocket clip style holder, and it can also be used with a lanyard or key-chain. Other versions include the K.I.S.S. Assist, using CRKT’s patented OutBurst opening mechanism, and the K.I.S.S. Two-Timer, which features two blades for different applications on the same basic frame as the standard model. 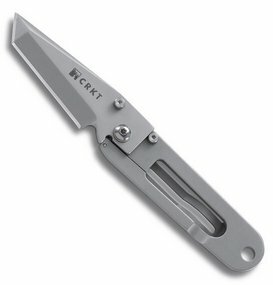 Another popular CRKT model is the Hissatsu folder created by designer James Williams. Unlike the “everyday carry” K.I.S.S. series of knives, the Hissatsu was designed with tactical applications in mind. Designer Williams is actually experienced in teaching special operations and security, and he brought this experience to bear on designing a compact folding knife that is still suitable for tactical applications. The knife includes a 3.875-inch, AUS-8 stainless steel blade in a “Samurai” design, released using the OutBurst system discussed above. In jurisdictions where the OutBurst assist may be considered illegal, it can be disabled using a simple screw mechanism. The Hissatsu also incorporates CRKT’s AutoLAWKS device, which gives it nearly the same stability as a fixed-blade knife in high-impact situations. All in all CRKT has much to offer the knife community as well as the casual consumer. It’s a competitive industry with plenty of first class manufacturers fighting for market share and CRKT’s approach to innovative designs is proving to be a winner.